Levi was a jewel. He was beautiful and precious, but also had many facets. Even more so, though, he allowed us to see the facet that we needed. He talked to each of us on our own level, gave us what we needed - and he never for asked anything on his own behalf. I didn't see him often enough when he was sick. My timing was always terrible. He was tired or asleep, or sick from treatments. I didn't have much to say, not really, because my own troubles seemed trivial; but he always asked how I was, how my learning was going, how my job was, how my kids were doing. I consider myself one of his non-successes. He always saw much greater potential in me than I was able to realize. 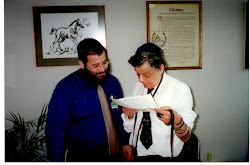 He always saw that I had it in me to be a better Jew, a better person, than I have achieved. And so with hopes that I can do that one more mitzvah, spend that extra time learning, spend that time Davening, I wipe away my tears and say Bimhayroh v'yameinu.